Help Your Trees to Weather the Storm!! Storms and heavy rains are inevitable and often likely here in the southeast. 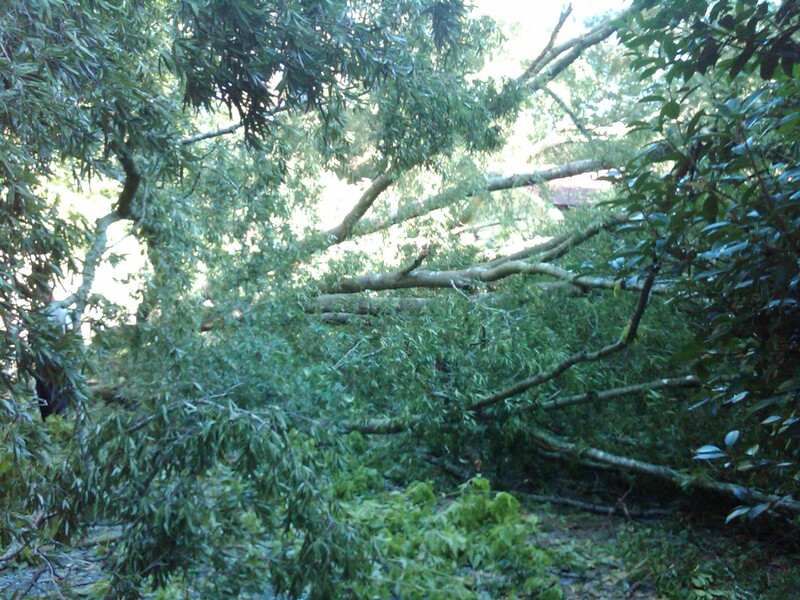 Tree damage and destruction often occur when the weather gets chaotic. We often see lightning struck, wind damaged, and uprooted trees when storms come through. Some of this damage is unpredictable, but there are certain measures that can be taken to reduce the chances of storm-damaged trees and/ or property damaged due to tree failure. When trees have their leaves, an incredible amount of wind resistance is created. Having your trees pruned and deadwooded decreases wind resistance, which can prevent broken branches and sections and even uprooting. So cleaning the dead, damaged, diseased, and broken branches and sections out of trees not only improves their asthetic value; it also makes storm and property damage less likely. Having your trees evaluated and assessed to discover potential risks is also a good idea. Way too frequently, we are called after the damage has been done. Numerous factors should be considered when performing tree risk assessments. Please contact us at 704-366-1134 or visit our website at AAAtrees.net to set up an evaluation.